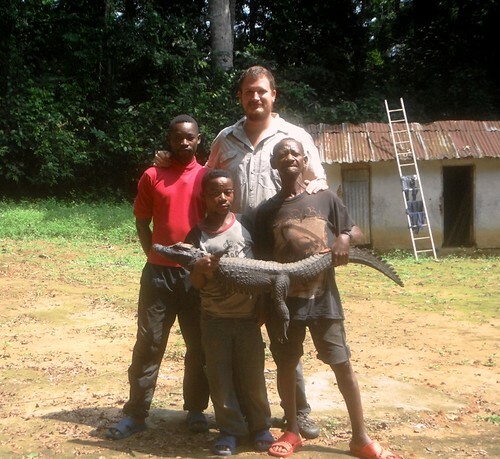 We had a croc-handling visitor accompany us to the Lomami River. He had already collected samples from a couple sites in Congo, including the Okapi Reserve in the Ituri. My name is Matt Shirley and I am a PhD candidate in the Dept. 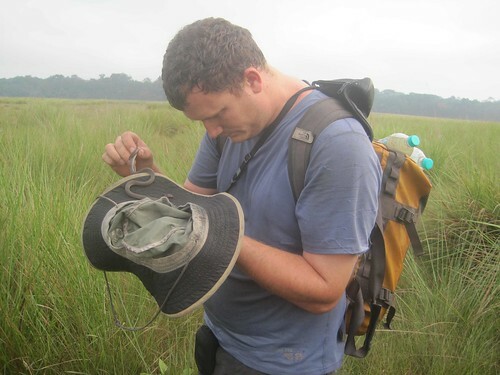 of Wildlife Ecology & Conservation at the University of Florida. Since 2005 I have been studying the ecology and evolution of African crocodiles in order to establish a basis for their conservation. My work has taken me on surveys throughout West and Central Africa (including Ghana, Cote d’Ivoire, Senegal, Gambia, Niger, Gabon, Uganda, and Egypt) to establish, in most cases, the very first information on crocodile population status and distribution in the region. In some places, like Senegal and The Gambia, my efforts have resulted in the rediscovery of crocodiles that were previously believed to be locally extinct. While in others, like Gabon, I have been able to document the global stronghold for the little known slender-snouted crocodile which is, unfortunately, all but extinct now through West Africa. 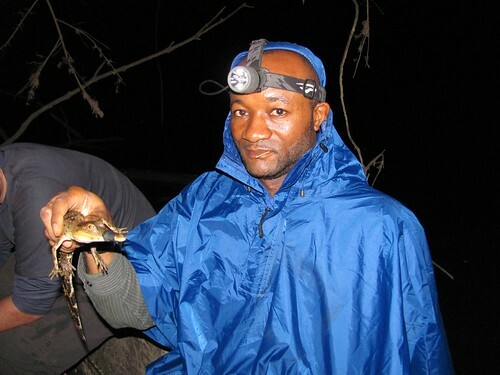 These efforts led me to be invited as a member of the IUCN/SSC Crocodile Specialist Group in 2009. Throughout my surveys I capture a selection of individuals to take small blood samples for genetic analysis. So far, extensive efforts have been made to assess the systematic status of both the dwarf crocodile (Osteolaemus tetraspis) and the Nile crocodile (Crocodylus niloticus). A study published by Eaton et al. (2009) diagnosed the presence of significant cryptic diversity within the dwarf crocodile, distinguishing three distinct species – O. osbornii (Congo Basin), O. tetraspis (Ogoouè Basin), and O. sp. nov. cf. tetraspis (West Africa). Since then, with the rediscovery of the Senegambian populations, I have diagnosed a critical Evolutionary Significant Unit within the new West African species. For the Nile crocodile, my recent paper (Hekkala and Shirley et al. 2011) has revealed that what we currently call the Nile crocodile is, in fact, also a cryptic species complex that is paraphyletic with respect to the New World crocodiles with deep divergence (ca. 10 million years ago). The newly recognized species – Crocodylus suchus – is primarily distributed throughout West and Central Africa with a few remnant populations in the Nile Valley of Uganda and Sudan. 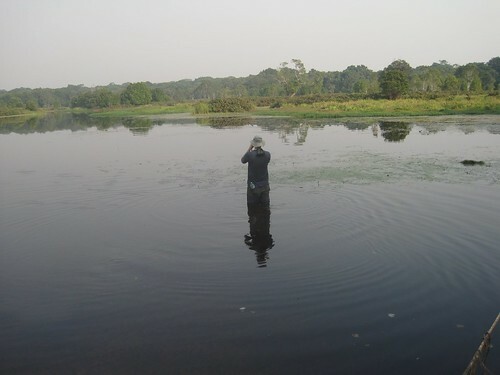 First, DR Congo is one of a very few countries in Africa that has never had a formal crocodile survey. Because of this, we have very little idea what species are distributed where, what is their population status, and how severe are the major threats. Second, DR Congo is one of the only countries identified so far that might have sympatric populations of Crocodylus niloticus and C. suchus. Finally, the systematic studies described above for the dwarf and Nile crocodile species complexes have yet to be carried out for the slender-snouted crocodile (Mecistops cataphractus). The slender-snouted crocodile shares, to a certain extent, the distribution of the others and is therefore subject to many of the same biogeographic processes. Unfortunately, the only region thus far with no samples available for this species is the geologic Congo Basin east to its easternmost populations in Lake Tanganyika. So, to these ends I made a trip to DR Congo in order to establish the very first, albeit very preliminary, data on population distribution and status and collect samples of the three crocodile species to further refine our understanding of the systematics and biogeography within these cryptic species complexes. 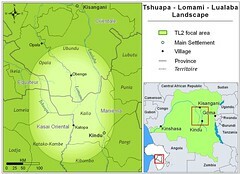 One of the target sites within DR Congo was the Lomami River and the newly proposed protected area in the TL2 landscape. I felt this area was critical because it is a very remote area with little human activity, and therefore had the potential to harbor significant populations of crocodiles. And, after exchanges with John and Terese, it became clear that at least one species – the Congo dwarf crocodile – was a constant presence in the local bushmeat trade and further evaluation of the sustainability of this resource is warranted. We decided on an itinerary – first looking at the proposed National Monument site Imame followed by the Lomami River itself. After a brief delay in Kindu due to some administrative snafu’s, I met my Congolese counterpart – Kinois Kitoko – and departed with the team to Chombe Kilima, our base to explore Imame. Imame and the Lomami River were Matt’s collecting/observing points, but he asked questions all along the way from Kindu to Katopa camp. 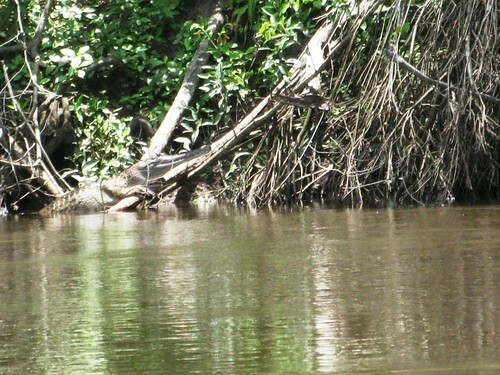 Imame is a site along the Nyamatende River identified by the local residents as important for crocodiles. Effectively, this is a site where the river leaves the forest and enters into an edo (bai)-like clearing and forms a pool surrounded by large floating grass mats that extend back to the forest edge. 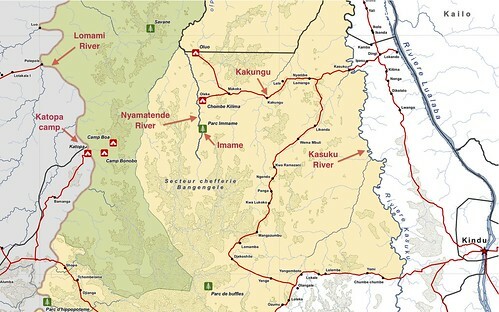 After winding through this unique, open habitat for less than 0.5 km the river again reenters the forest on its way past Chombe Kilima, to the Loidjo River and eventually the Lomami River. Local fishermen used to fish this site regularly and often encountered many nkondenkonde (the slender-snouted crocodile). We visited this site on two occasions, once during the day for a preliminary scouting mission and once at night to better census the population and understand the demographic classes that use the site. During the day we encountered ±13 individuals, all of which were larger than 1.5 m total length and many of which were larger than 2.5 m! The night survey painted much the same picture though closer to 20 individuals were detected. 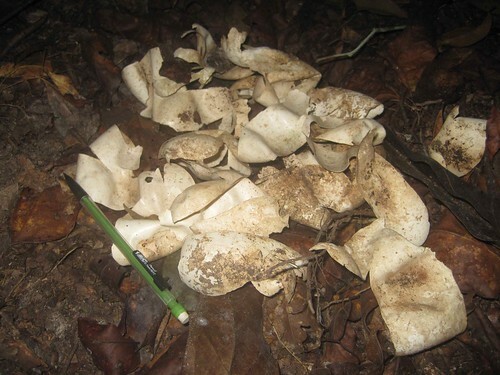 In addition to the same group of large adults, at least four small animals of ± 1.0 m were observed, though no hatchling/yearlings were encountered. From these observations, additionally considering data collected from surveying the Nyamatende River on two separate occasions, it appears that Imame is a critical site for the adult population of slender-snouted crocodiles outside the breeding season. This area is relatively difficult to access from the nearest village, provides a constant source of deep water and prey during the dry season, and due to its openness provides ample opportunity for basking and thermoregulation. Further work needs to be done to verify this, but nesting likely takes place inside the forested areas of the river within a couple kilometers of Imame. After hatching, the adults return to Imame while the young exploit the forested river as a nursery. The latter was confirmed through observations of young slender-snouted crocodiles distributed throughout the Nyamatende River. After visiting Imame we embarked on a long, two-day walk to the Katopa camp on the Lomami River. This was to be our base for the next 4 nights of surveying and sampling. The night of arrival we did a quick survey 15 km downstream largely to orient the new team members (notably Balanga, our pinacier or dugout captain) to the survey and capture methods. Our survey craft was an enormous, 15 m dugout pirogue with a 15 hp outboard motor. Needless to say, maneuverability and response time potentially presented significant challenges to approaching and capturing crocodiles. On the downstream trip we focused largely on learning communication signals between the surveyor and the pinacier, spotlighting crocodiles and identifying the species and size classes present. We additionally stopped at two fishing camps along the way to ask about lokokele (dwarf crocodile) hunting. Interestingly, the fishermen along the Lomami claimed that lokokele hunting was largely done during the rainy season when water levels were high and the forested margins of the river were flooded. They claim that during the dry season the lokokele retreat to their burrows and rarely come out. This is in contrast to villagers who live in the Kasuku basin at Kakungu village who explained that they primarily hunt lokokele during the dry season. This area has many streams and significant flooded forest that is, presumably, largely inaccessible during high water. In both places the hunters are largely placing baited hooks at the entrances to burrows and waiting for the crocodiles to be caught. 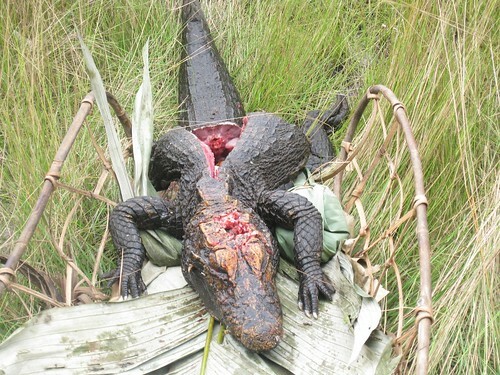 This hunting style is practiced throughout Central Africa, but in many other places the hunters actually go out at night to actively hunt the crocodiles outside of their burrows. The latter method can be much more damaging to a population if unregulated due to higher levels of detection. The lokokele fishery in this region, while probably not as destructive as the hunting of other exploited species, is an important source of income and protein for local communities. Its dynamics should be further explored and, if appropriate, can be encouraged as a sustainable resource for people living around the new protected area. 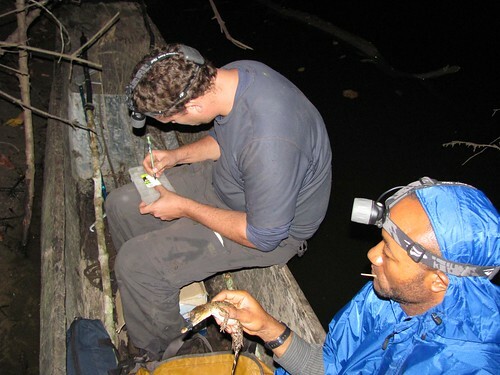 Going back to the first night of surveys on the Lomami River, on the return trip to camp we continued the training and focused largely on trying to capture animals for sampling. 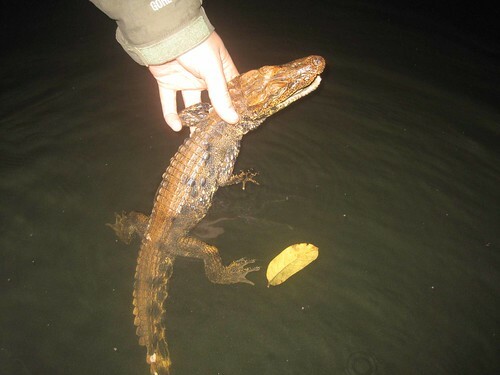 We were successful with two small slender-snouted crocodiles, the first samples taken thus far! This was a good experience for everyone, to handle a live crocodile for the first time, observe the measurements taken and the blood sampling protocol. Halfway back I gave the spotlight to Kinois so that he could begin some preliminary training in spotlighting for crocodiles. Kinois quickly got the hang of the method and was detecting individuals easily. 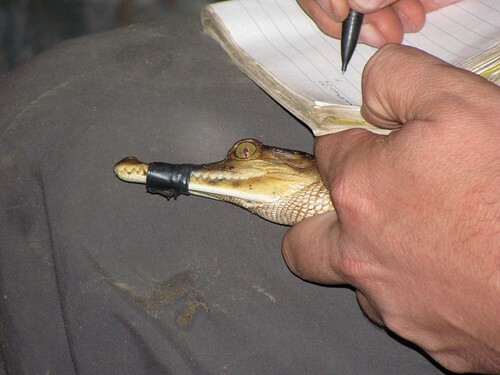 During crocodile surveys, the two most critical pieces of data to collect on detected individuals are the species identification and their size class. The former is usually not a challenge, at least not in Central Africa where the three crocodile species are relatively easily distinguished, but the latter is a skill that takes a lot of time and experience to hone. Kinois displayed solid competence in species identification, as well as solid potential to develop the sizing skills! Additionally on the return trip, we were successful in finding a slender-snouted crocodile nest site. 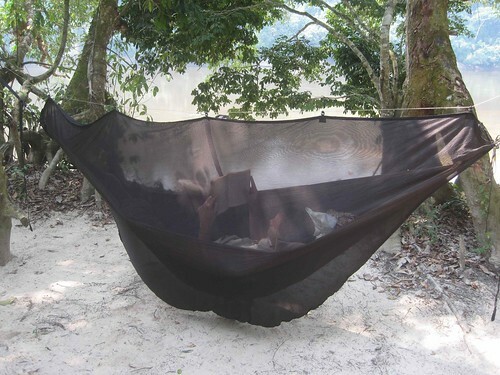 The nest was placed on an elevated section of shoreline between the river and a flooded forest pool. It is likely that the female occupied the flooded pool while guarding the nest and that she brought the young into the pool after they hatched until it dried back into the main river. This was a good opportunity for the team to not only see a nest site, but to begin to fully comprehend just how challenging it would be to monitor the slender-snouted crocodile population through indices of nest effort and success. This species, as well as the dwarf crocodile, does an amazing job at hiding their nest sites and for this reason, coupled with low nesting density, nest surveys would not be an effective means of population monitoring. The next morning plans were made to go down river approximately 50 km and work our way back, surveying and catching animals over a two night period. 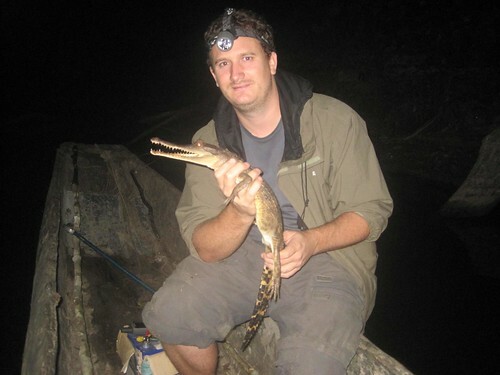 Over the course of these next two work nights we successfully collected additional slender-snouted crocodile samples, as well as the only two dwarf crocodile samples from this area. The survey data are not yet analyzed, but a couple of interesting characteristics stand out. the encounter rate was relatively low – on par with 1.0 – 1.5 crocodiles/km. I guess I should clarify that this is “superficially low”, simply because the site is so remote, uninhabited and seemingly unexploited. However, many aspects, most notably ecosystem productivity, have yet to be thoroughly explored and it could just be that the population density is naturally low for reasons such as this. an interesting low abundance of adult and sub-adults individuals. Over the course of +/- 50 km only three animals in the adult size class (> 2.0 m) were detected, all other encounters were juveniles with the exception of the hatchlings from the one nest from this year. This is a bit concerning as it suggests recruitment is low. Further work needs to be done and more long-term data must be collected to determine exactly what is going on here. Additionally, comparative data with sites further downstream would be informative. In all this was a very successful preliminary examination of the crocodile population in and around the TL2 landscape. We demonstrated that Imame is an important site worth further protection and, in fact, the local Chombe Kilima community has already agreed to support this effort by preventing further fishing at the site. We have collected some preliminary information regarding the dwarf crocodile fishery, which will prove important in devising a plan and protocol for further study. And the samples collected from both crocodile species will be the first ever analyzed from within the arc of the Congo River. These will certainly prove informative about the evolutionary history of crocodiles in this region. This entry was written by Terese Hart, posted on 2011-07-29 at 9:13 pm, filed under About the project, Natural History of TL2, The Forest. Bookmark the permalink. Follow any comments here with the RSS feed for this post. Post a comment or leave a trackback: Trackback URL. can i use pictures or parts of this article for my personal purposes of course by respecting the copyright. is there any possibility to get in contact with you by mail oder phone? Would like to talk to you about a film project where your advise or assistance could be of great help. Thanks for all the fantastic work you’re doing, as well as for this great blog. I hope you are well. Enjoyed your blog! Is the last picture of a slender-snouted juvenile? 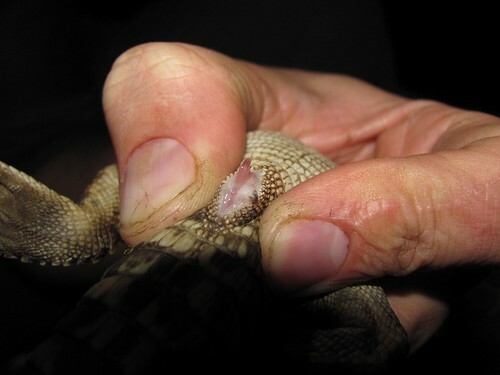 No — good slender snout juvenile pic is where Matt is holding one and taking notes. I assume that is a juvenile dwarf crocodile. This looks like an awesome research project! Were the results published in a journal? I’d love to read up more on it. In addition, I’m actually a university student looking for a Master’s project. I would like to discuss some possibilities with you if possible, but I couldn’t find any contact information. Is there an email I could reach you by?